On a recent tour of Israel, I spent some good time with my old friend Douglas Jacoby. We discussed the Psalms and he mentioned the book he’s written on them called “Thrive!”. I bought a copy and started reading it straight away. It’s been blessing my spiritual life and I thought I’d bring you a brief description and review of the book for today’s quiet time coaching episode. Please let me know what you think of Psalms, books on the Psalms, and Douglas’s book if you’ve read it. What is the connection between the kingdom of the heavens, peace and joy? I’m teaching a three-part series on the kingdom for the Thames Valley churches of Christ. There’s no way I will do it justice, but I do hope to make it more relevant to myself and the congregation. One of the kingdom verses which has given me the most pause to think and pray is Romans 14:17-18. The key phrase here for me, is “inner rightness”. Far be it from me to criticise the NIV or Tom Wright, and I’m sure the translations are correct, but the Willard version emphasises the personal connection with Jesus. It is this personal connection which ensures our ability to experience the peace and joy of the Messiah. It is he who gives us peace (John 14:27) and joy (John 15:11). Why are we confident of this personal connection? Because Jesus promised, “I will be with you” Matthew 28:20. Since we have the spirit of Christ, we can enjoy the fruits of that spirit (Rom 8.9; Gal 5.22). Would you like more joy and peace? Practice becoming more aware of the presence of Jesus. That is why we pray, and engage with spiritual disciplines. Not to make us “better”, but to make us more aware and thus more connected with the source of peace and joy. And the benefit? Why do we need to question the benefits of more peace and joy! But, we should also be aware that the fuller our experience of the peace and joy of the spirit, the more it will set us apart in this world as people who have something others need. Those with spiritual hunger will sit up and take notice. The kingdom has many facets. But perhaps, practically, the most fundamental is the opportunity to avail ourselves of a supernatural peace and joy for which we were always designed. If you’d like a copy of my free eBook on spiritual disciplines, “How God grows His people”, sign up at my website. If you are watching the video you will notice that I am not my usual place to record today’s quiet time coaching episode. That’s because I felt called, drawn even, to go back to a place where I prayed regularly five years ago. I have just finished my prayer time there and wanted to share the experience with you. Where did I go? I went to a viewpoint overlooking the Harrow area of north-west London. You can see all of North West and West London from this place. It’s a wonderful view. I used to come up here regularly to pray. Sometimes early in the morning, sometimes late at night when the lights were shining and the stars were twinkling. Behind the car park for the viewpoint are some woods. The area is called Grimsdyke. I came here to pray 3, 4 or five times a week between 2000 and 2013. It became the most important prayer place for me during that time. I came up here with my dog in the sunshine, the rain, snow and whatever else the weather threw at us and we walked, and I prayed. It’s five years since I was last here. It was so helpful today to reflect on all the lessons God has taught me the last five years. To realise that his disciplining hand has always been for my good. To celebrate his grace to me. My soul is refreshed. Is there somewhere significant to you, that you could go back to and pray? Somewhere you haven’t been for a while. Perhaps a place where you used to worship, the location of your baptism into Christ, a regular former prayer spot or something similar? I’m so glad I came here today. I am refreshed and ready for my Monday (I’m recording this on a Monday) and my week. Have you returned to be refreshed? I would love to know your experiences. Please leave a comment wherever you read or see or hear these recordings. Please leave it publicly because we learn best when the learn in community. If you know someone who might benefit from these thoughts, please pass the link on to them. If you’re listening to the podcast, please leave us a review. If you’re watching the video, please hit the like button and the subscribe button and then you will be notified when new recordings go online. I pray that between now and the next time we see each other you will find great refreshment from being reminded what God has done in the last year, or five or ten of your life. We lead busy lives. Sometimes we forget God’s presence, and we do not have opportunity for lengthy prayer. What to do? These can be a simple word, or a short phrase that is repeated throughout the day bringing remembrance to us that God is with us in all circumstances. “Speak them inwardly and they will speak back to you all through the day’s changing circumstances. Because the words are so few and so simple, they help us to soar beyond language into the mystery of silence. “One single grateful thought, raised to heaven, is a perfect prayer.“ Lessing, Minna Von Barnhelm, ii, 7. I’ve come up with a different arrow prayer for each day of the week. Why not make up your own? Balthasar Hubmaier was an Anabaptist leader who wrote this short meditation in 1526. Soon afterwards he was arrested, tortured and executed for his faith. Our Father. Gracious Father, I am not worthy to be called a child of yours or that I should be able to call you my Father. I have not always done your will. I have often done the will of the Father of Lies. Forgive me, merciful Father, and make me a child of yours in the faith. Who Art In Heaven. Father of goodness, look upon us, we who live in this miserable state of woe. We know that children cannot find a better condition than to be with their loving father, who feeds them, gives them drink, clothes them, protects them and shields them from all needs. Gracious Father, take us, your miserable children, to be with you in heaven. Holy Is Your Name. Merciful Father, we know that we are guilty of continually dishonoring your name with our words and actions. The suffering of Christ, which for us is medicament for eternal life, we make into an eternal reproach by our cursing and rebuking. Forgive us, Father, and give us grace so that your name will never come from our mouths unprofitably. Help us to cease all blasphemy and swearing so that your holy name will eternally be glorified, enhanced and praised. Your Kingdom Come. Gracious Father, we know that we are captives to sin, the devil, hell and eternal death. But Father, we cry out and call to you as our loving Father to come quickly with your kingdom of grace, peace, joy and eternal salvation. Come to our aid, gracious Father, for without you we are totally miserable, afflicted and lost. Your Will Be Done On Earth As In Heaven. Good Father, we confess publicly that your fatherly will does not suit us earthly people. Our will is completely and totally hostile to your divine will. We ask you to send your Holy Spirit to work in us authentic faith, steadfast hope and ardent love, so that our will is conformed to your divine will in all things. Give Us Today Our Daily Bread. Compassionate Father, we live not by bread alone, but by every word that comes from your holy mouth. Therefore, we humbly pray that you will feed us with the bread of your holy word. This is the bread of heaven, and whoever eats it will be eternally filled. Make it a living presence in our souls. Make it grow and bring forth fruits of eternal life. Give us diligent Christian workers who will spread this bread among us in pure, clear and untarnished manner so that your Fatherly will, which is known only from your word, will be fulfilled. Forgive Us Our Debts As We Forgive Our Debtors. Kind Father, we know that we are guilty of having sinned in words, deeds and evil thoughts. We do not even know the number, portion or extent of our sins. Father, forgive us and give us power to better our way of living, even as we forgive those who have caused our suffering. Father, forgive them too, for they do not know what they are doing. Enlighten all those who misunderstand your holy word, who abuse and persecute us, so that they might come to the true way that leads to eternal life. Lead Us Not Into Temptation. Heavenly Father! Look on the fear, barrenness, misery, persecution and hardship which we must endure here on earth, and ponder also our human weakness. For this reason, sweet Father, we ask of you, through your Fatherly love, that you do not forsake us in our anguish and suffering, that we not be defeated nor fall away from your holy word. Do not allow us to be tempted beyond that which we can endure. We are weak and frail, while our enemies are strong, powerful and heartless. You know these things, merciful Father. Deliver Us From Evil. Deliver us from evil, from sin, from the devil, from our own lust, which is our greatest enemy. Deliver us from all that keeps us far from you. Moreover, give us all that brings us closer to you. For dominion, power and glory are yours forever in eternity. Eternal Father, as we have prayed to you here, bring it to fulfilment according to your Fatherly good will. These things we pray through your mercy and through your gracious promises which you have given to us consistently through Moses, the prophets and the apostles. But we pray this especially, pleading with you, through your most beloved son, our Lord Jesus Christ. He has surely promised us, and proved it through his bitter death, that whatever we pray for in your name you will give us. Father, we place our bodies, lives, honour, possessions, soul and spirit into your hands. All that we have received from you we offer back to you, for you give and you take away. Praise be to your name. Amen and amen. I’m very privileged to bring you a post on prayer by my friend Dr Steve Kinnard. We’ve known each other a few decades now, and I have benefitted significantly from his lessons, conversations and reading his books. This blog post originally appeared on Steve’s site, November 7, 2016. The Garden of Gethsemane is a special place for my family. When we lived in Jerusalem, we often had family devotionals in Gethsemane. Our daughter Chelsea adopted an olive tree that she would climb. Chelsea would lay upon one of its branches and pray. We called that olive tree–The Chelsea Tree. 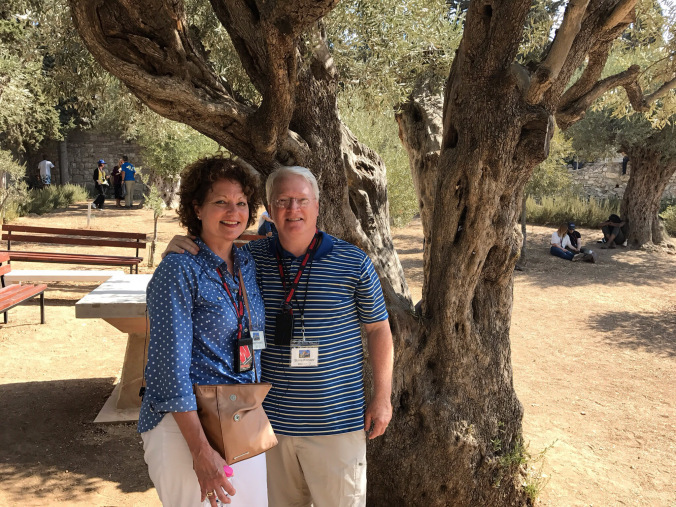 We visited the tree on our recent trip to Gethsemane. It is still a strong, healthy tree. And our daughter Chelsea has grown into an amazing woman of God. We are blessed. Let’s meditate on the story of Jesus in Gethsemane. Jesus asked his disciples to perform one task–Keep watch with him. Stay awake with Him. Stated in the negative this is–don’t fall asleep on Jesus. Stay awake. Stay awake and pray. Stay awake and pray so that you don’t fall into temptation. Stay awake and pray so that you don’t fall into temptation because the spirit is willing, but the flesh is weak. One task. KEEP watch. Stay awake. I don’t want to be too hard on the disciples. Luke, who was not one of the original disciples, informs us that the disciples were exhausted with sorrow. I get that. When I’m sad, full of sorrow, I want to sleep. Sometimes when I see a really depressing movie, I say, “I need a nap after that.” I sleep hoping that while I’m sleeping the situation will change, and I won’t have to be sad anymore. But so far, sleep has never caused the situation to go away. So I don’t want to be too hard on the disciples because I understand what it means to be exhausted with sorrow. And they had had a long, difficult week with Jesus. At the same time, I also realize that if a really good friend asked me to stay awake while he prayed, I’d find a way to stay awake. Especially if there were three of us who were fighting to stay awake. We could help each other stay awake. Let’s say my good friend Troy Baker asked me to pray with him. I’d be honored to pray with Troy. Troy says, “Steve, just keep watch for me while I pray.” That’s risky leaving me alone to keep watch. But then Troy invites another friend Mike Santorio to join me. Ain’t no way Mike Santorio is going to allow me to fall asleep. He would have me doing push ups if I began to look sleepy. Then Troy invites another friend Lance Sarincino to join us. Lance is an amazing guy. But, at times, Lance can be a little scary. And I’m pretty sure Lance likes it that way. So I wouldn’t fall asleep because Lance might tie me up and dangle me from a cliff. I’m sure pictures of me dangling from that cliff would be posted on Facebook the next day. My point it this–it only takes one person who is invested to make sure the others stay awake. Be that person. I think Peter, James, and John could have kept each other awake. If one of the three had been intentional about keeping watch, then he could have kept the others awake. But that’s not where there minds were. They failed to Keep Watch. They failed to stay awake with Jesus. If you are going to keep watch with Jesus, you have to be intentional about it. Staying awake with Jesus doesn’t happen by accident. If we aren’t careful, we can easily sleepwalk through our spiritual lives. We get up in the morning, have our routine quiet time, rush off to work or to school, rush back home after work, have a quick dinner with the family, perhaps run out to a regular midweek Bible study, come back home, go to bed, and wake up the next day for the same routine. We aren’t intentional about growing to be more and more like Jesus, so we don’t grow spiritually. We maintain the status quo, but we don’t grow. So we must decide to Keep Watch with Jesus. We must decide to stay awake and not to sleep walk. The older I get, all I want to know about, learn about, focus on, think about, meditate on is Jesus. Because Jesus is THE difference maker in life. He gives me energy. He gives me purpose. When I’m selfish, I think about the selflessness of Jesus. When I’m lazy about pursuing God, I think about how Jesus would get up early to pray with God or stay up the whole night in prayer. When I’m struggling with love for neighbor, I see the way Jesus touched lepers and spoke with outsiders like the Samaritan woman and cared for people with a selfless, agape love. I know one of the most special aspects about being in the Holy Land is knowing that you are walking where Jesus walked. On our tours, we love to focus on the spots where we know Jesus walked there. You don’t see signs in Aramaic that read “Jesus slept here,” but you do have places where you know Jesus was. Like the Sea of Galilee. The steps of the southern Temple Mount. It’s exciting to be in those places. I love those spots. But I think the question we each need to ask is, “Am I going to walk in the steps of Jesus every day of my life wherever I might be in life?” Because the steps of Jesus lead to the needy, the lonely, the hurting, and the lost. The steps of Jesus lead to great relationships within his kingdom–helping, helpful, encouraging relationships. The steps of Jesus lead to keeping the unity of the Spirit and the bond of peace. The steps of Jesus lead to building up the kingdom. So keep watch with Jesus. Keep watch by obeying his commands. Keep watch by getting into his word and letting the word change your heart. Keep watch and pray. Pray that you will not give into temptation for the spirit is willing but the flesh is weak. Be intentional. Have great times in the word. Have inspiring pray times. Decide to be with positive people who build you up and don’t drag you down. Flee temptation. James says that if you flee temptation, the devil will run from you. When is the last time you made the devil run? Will you stay awake with Jesus? Will you stay awake and pray? Will you stay awake and pray so that you will not to fall into temptation? We tried something a little different this last Sunday – around 30 minutes of singing, prayer and readings at the beginning of our service. See what you think of what we did. It is warts-and-all, so be kind! Please share your ideas here by leaving a comment. And please pass this on to one other person. How often do you say the word, “Amen” in a church service? Not as a response to a prayer or statement from another person, but as a filler word? It’s probably more often than you think. I do it more than what I would like to admit. The frequency has declined, but it still happens from time to time. Why does it matter? It matters because the word, “Amen” is a Bible word rich in spiritual meaning. 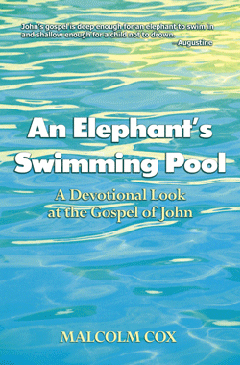 To use it loosely empties it of its potential power, and compromises its God-given purpose. “Amen” comes from the Hebrew verb ‘mn. When we say “Amen” we are saying a Hebrew word that has been used for millennia. It means: surely, truth, most certainly, so be it, to be faithful, reliable, steadfast, established, firm. The word, “Amen” was used in synagogues and the Temple. Since then it has become common in both Christian and Muslim circles. It has been adopted as a transliteration by many languages. The Hebrew version of the word is found in 25 verses of the Old Testament. The Greek version of “Amen” is found in 104 verses of the New Testament, translated in a variety of ways (Amen, truly, very). It is most common in the Gospels, with Matthew (31), and John (50) containing by far the most. In the New Testament “Amen” is used as an indicator that something important is about to be said. Jesus said “Amen, Amen” (translated as “Verily, verily,” or “truly, truly”) before some of his most important pronouncements. Agreement: a congregation might say “Amen” spontaneously in agreement with a speaker. In saying “Amen” we, as the body of Christ, are giving collective spiritual agreement to the truth of what has been said. There is much power in this corporate assent. Jerome recorded that the Amen of his congregation was “like thunder shaking the empty temples of the idols”! Unity: “Amen can express unanimity of belief. This is the predominant sense at the conclusion of the creeds. As a spontaneous personal response to something said in the church service, most often the sermon. As a seal on baptism (as above in point 4). As a filler between songs, at the end of speaking slots. Too often the word is used to mask insecurity in the speaker or worship leader or fill a moment of silence. Using the word, “Amen” in our times of corporate worship is thoroughly biblical and helpful. However, we might want to rethink the habits, traditions and customs we have adopted. Let us consider whether the way we use the word, “Amen” is serving a useful spiritual purpose. Stop using the word, “Amen” as a filler in corporate worship. Instead, allow silence. Or say something more meaningful about what has just been said or sung, and what is about to be said or sung. The key to improving is to be better prepared and consider in advance what to say, for example, at the end of a song. Continue using the word, “Amen” in all other corporate worship circumstances. What are your thoughts on this topic? Do you think it’s worth trying to eradicate the use of the word, “Amen” as a filler? Am I being too fussy? What have you done to reduce the use of filler words? Please leave a comment wherever you hear or see this or read this. I would love to know what you think. We learn best when we learn in community. Please pass the link to this recording/article to at least one other person who might benefit from it. If you are watching the YouTube version, please click the ‘like’ button. It helps this video to become more visible to more people. If you have not already done so, please subscribe to the podcast or the YouTube channel or the website where you found this article. That will make sure you don’t miss future videos, recordings and articles. Thank you so much for reading, listening and watching. I hope that the next time you gather with your friends to worship God, you will have a cracking time of corporate worship. We can all say, “AMEN” to that! How do we keep the worship flow going? What prevents the songs from being separate items? I share something we tried at church last Sunday.